This year marks a milestone anniversary — and questions regarding the emerging digital economy — for the Urban League of Greater Pittsburgh. As the Urban League of Greater Pittsburgh celebrates its 100th anniversary, it’s difficult not to notice how many of the same battles waged at its inception continue today. The venues may have shifted from railroads and factory floors to sprawling tech campuses, but issues surrounding educational equity, equal pay and fair hiring and promotion persist. 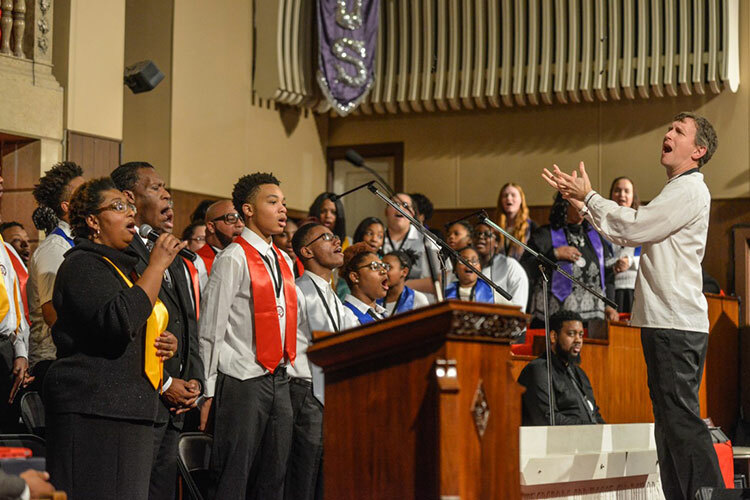 This month, the affiliate will recognize a century of service targeted to uplift the city’s black neighborhoods during its State of Black Pittsburgh presentation. And while the world’s largest tech companies — several of which maintain offices embedded within Pittsburgh’s urban communities — offer tickets to the middle class for many workers, their workforces remain predominantly white and male. Progress remains frustratingly distant, says Esther Bush, president and CEO of the Urban League of Greater Pittsburgh. “The goal moved further away,” she notes, adding that black Americans are still working to close wealth gaps that widened during the 2008 recession while simultaneously acquiring skills needed to land a job in the tech industry. Out of 175 participants the organization trained during the 2016-17 fiscal year through its Urban Senior Job Program, only 11 were connected with jobs upon completion. And while plenty of local homeowners delighted in seeing the value of their assets climb, 869 residents sought help from the Urban League’s housing assistance program to relocate or avoid eviction — up from 848 in 2015-16. Hoping to take a comprehensive approach to tackling the digital divide, the Urban League of Greater Pittsburgh and other affiliates follow the National Urban League’s lead in tying housing, health, education and economic empowerment to participation in the tech economy. “All across America, National Urban League affiliates are innovating in providing STEM education and providing workers with skills to join the digital economy,” says National Urban League President Marc Morial, who will appear in Pittsburgh for the anniversary celebration. Closing the “digital divide” is a priority for the Urban League nationwide, says Don Cravins Jr., executive director of the National Urban League’s Washington bureau. “During the agricultural revolution, we were in slavery. During the industrial revolution, we were battling Jim Crow. African-Americans cannot miss the digital revolution. In terms of advocacy, the National Urban League and its affiliates will particularly stay abreast of how automation will impact jobs primarily held by blacks and Latinos, examine the state of broadband and support broadband expansion in underrepresented city and rural communities and explore ways black entrepreneurs can take advantage of ultra-high-speed 5G mobile networks expected to be rolled out by AT&T in Pittsburgh as early as next year. Bush and Morial will discuss strategies the local and national chapter will implement on June 7 at 8 p.m. on WQED-TV during the State of Black Pittsburgh, a panel discussion centering around the Urban League’s annual report.